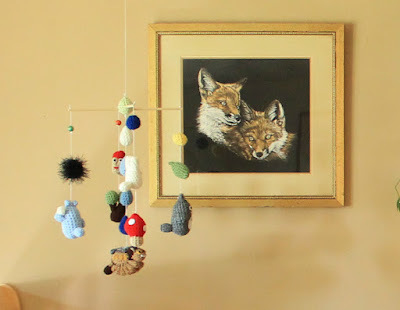 I knew we would do a woodland themed nursery long before we knew we were expecting. We love the woods, and we love nature, and I've been collecting woodland themed things for ...well... a long time. When we first found out that I was pregnant it was actually a bit of a surprise - we had been trying but between work and my Etsy businesses, I had zero time. So I stopped really paying attention to my cycles and lo! Next thing you know it's February and I'm late for my period. And into the picture comes our Little Fox. We found out it was a boy at the second ultrasound, and I immediately began thinking of names. If it was a girl, we had a few names picked out and we were going to wait until she was born to see what her personality was like, but for Little Fox it just fell into place. Aj really wanted to name the boy after his best friend, and also his father. I really wanted to name him Fox. We came to an agreement and decided on Christopher James Fox Jasper. He'll have plenty of options when he's older for what he wants to be called, but as long as he is little enough to not know better he'll be our Little Fox! Since I work from home out of my studio, and Aj is working through his electrical courses and still needs a quiet place to study (not to mention play music!) we knew we wanted to have a "Nursery Nook" as opposed to an actual nursery. We talked about that long before we conceived, when we discussed what we hoped for from a baby and how they would fit into our lives. Eventually, I will move my studio to our basement where I already have my Foxburrow photography studio and storage, and we have the guest bedroom. However, we have to put heat down there for the brutal New England winters before I can go anywhere. 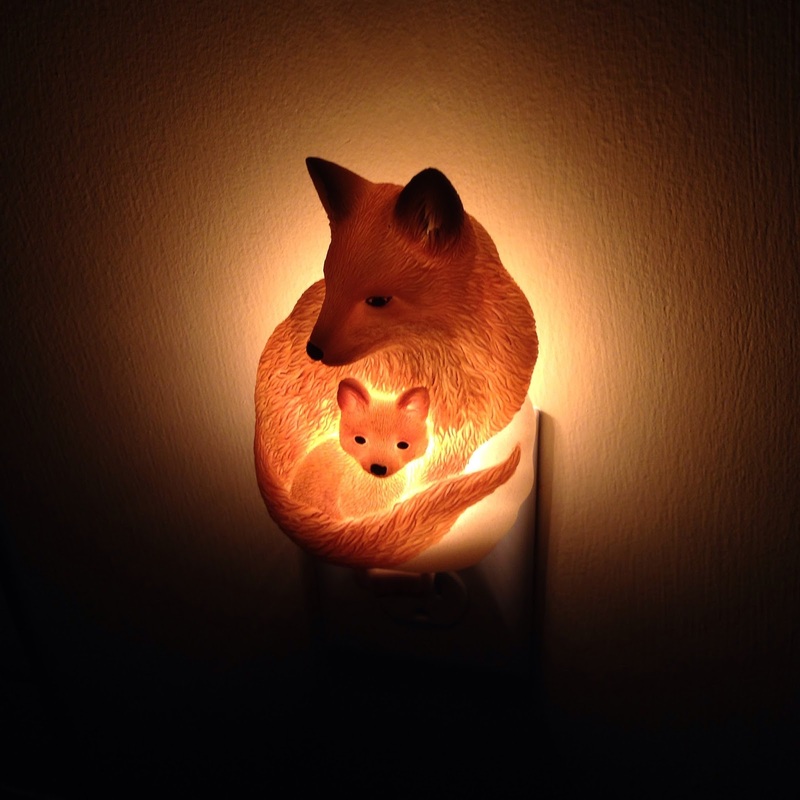 So while we're raising a baby and remodeling the house, Little Fox will have a more integrated place to stay. A lot of people really questioned this decision, but now the living room really feels "right" to us, and it just feels like Little Fox will be more a part of the family in a community space. We don't use the living room a lot, so we don't foresee early bedtimes or naps being a problem. However, when he's still a newborn he will sleep in his bassinet in our bedroom. Artwork from Sweet Melody Designs on Etsy - a surprise gift from our baby shower! I love this fox wall art. It was one of the first things I bought for the nursery - I actually found it at a flea market for just $30. It's so beautifully done, and the detail in the fur and eyes is amazing. For the dresser, I bought the Ikea Tarva 3 drawer chest and my good friend from Sand + Sparkle came over to help me paint it. I picked a soft, mossy green. I wanted it to fit in with our living room and feel like an extension of the space, so I picked colors that would work well with our existing furniture and decor. 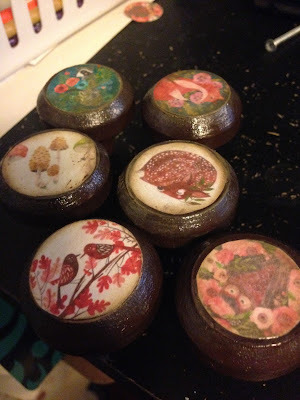 I painted and decoupaged the knobs on the dresser with artwork from Oana Befort. I considered picking up some woodland critter knobs from Anthropologie, but since I'm self employed now I had to do something thriftier. We'll be doing cloth diapers after the first week so we ordered a starter set of 10 Best Bottoms diapers. They have little owls and foxes and hedgehogs on them...too cute. Aj really had a hard sell getting me to agree to cloth diapers. The things he described about the process did NOT help. But he finally got me with the impact to the environment over the length of the diapering process. When I did some research I found that cloth diapering has really come a long way from the past, and I set to work choosing the right cloth diaper for us. These have a gridwork of snaps that will allow them to be worn from birth until he's no longer in diapers - yay! They also have the option for disposable inserts for situations when you really don't want to be toting around a bunch of cloth pads to be cleaned. That was a big factor in my choice. 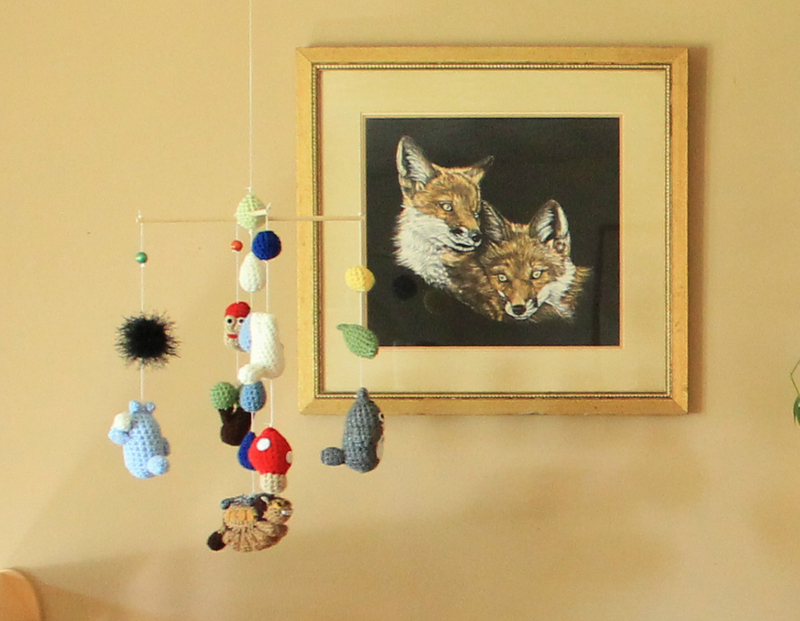 The little fox hat hanging on the picture frame was also a gift from our baby shower, and came from Etsy. The Totoro music box spins and plays the theme from Totoro - it was a gift from my host sister when I left Japan after studying abroad. It goes so nicely with the little mobile we got as a gift! From Etsy shop AmiAmigos. I put his little toys in a vintage plant hanger I found at a thrift store. He doesn't have many toys at this point (and we plan to keep it that way). In the basket there's a crinkle tag ball that I made for him, a blanket fox plush from my god mother, a vintage hedgehog hand puppet that I found long ago and squirreled away for our future little one, and a fox plush from WWF that Aj brought home for me from a trip. Our general philosophy is less is more. We don't want to end up drowning in toys, especially with his space being part of our living space. The little fox figurines are actually salt and pepper shakers from my grandmother. I thought they looked cute nesting in the leaves. The ivy plant I've had for almost 5 years! It came from the book store I used to work at when it closed. I found the wicker baskets at the Goodwill Outlet for pennies. They're both empty right now but I'm sure they will fill with something or other eventually. Our glider we picked up from a Facebook Yard Sale post for $20. It was white, and had an ottoman with no cushion. We didn't want the ottoman anyway, so we bought it and painted it dark brown to match our furniture (thanks Ashley!). I definitely didn't want to keep the cushions it came with, and looked at custom options on Etsy. There were lots of nice ones, but the price and the time frame didn't match what we needed, so the cushions came from Wayfair.com. I had the rug from Pier 1 already, and the white fox statue which was on our mantle, and I snagged the lamp from Target to complete the space. The wicker basket is to hold my breast pump stuff, and I picked one with a lid to keep the dogs away. Scored that for $1 at the flea market, along with the vintage wicker plant stand (also $1...must be my favorite price)! The rabbit pillows help make the glider perfect. The fabric I got in Japan last year and I used soft minky fabric for the back. The long rabbit fits nicely behind the neck too. Next to the rocker are a few of our favorite books, including a couple of my Dr Seuss books from childhood, and Little Fox's first primer on sushi. We have a TON of children's books in our closets and downstairs in the guest bedroom. I've been collecting them for years and years. Nearby on the wall is his soft glow night light. This is one of my favorite things in the nursery. Here. How amazing is this fox blanket we got from our baby shower! It's hand crocheted and I know it will be a household favorite. So whenever you're ready, little one...we're ready for you!